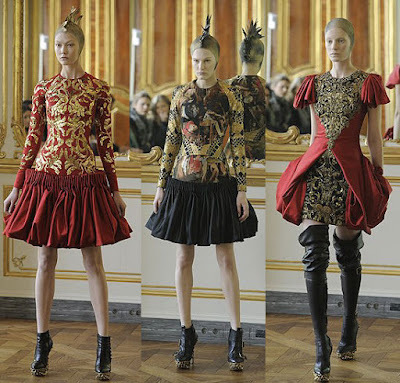 Yesterday at the Paris fall winter 2010 fashion week, our beloved fashion designer Alexander McQueen whom pass away couple weeks ago had an appointment only salon presentation of his last collection that he was working on before his tragic death. 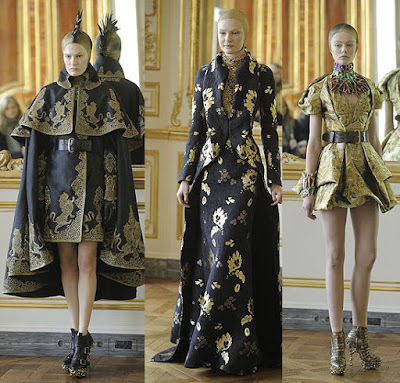 In his latest & last collection, McQueen got back to what he loved the most, the hand craftsmanship of the Haute Couture and the things that are been lost in the making of fashion. 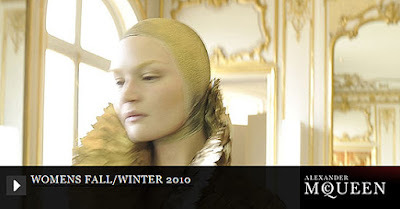 He was inspired by the art of the Dark Ages, a sense of poetic, medieval beauty that dealt with religious iconography. 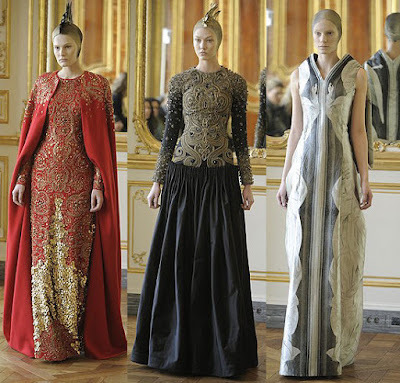 In the show, it had a hunting soundtrack of operatic music in the background, the presentation was solemn, funereal and a little spooky. 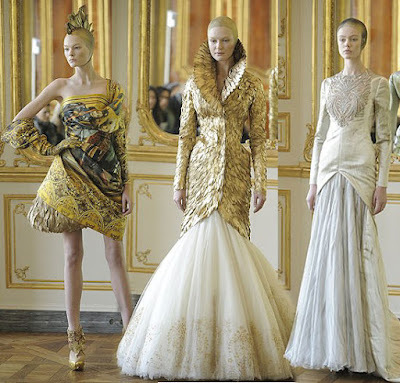 McQueen’s bi-annual fashion show extravaganza had always been the highlights of the Paris or London fashion week, and a Must-See show for every fashion editors, photographers and fashionistas! Instead of the usual big production show, yesterday’s intimate setting allowed the guests having the opportunity for an up-closed appreciations of the details of his masterpieces, and honored his designs for the very last time. 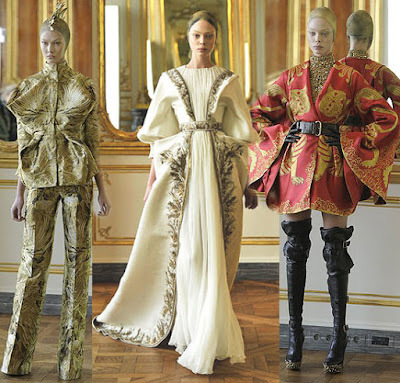 By mixing the new technology with arts from the past, he had digitally transferred the paintings of high-church angels and Bosch demons into hand-loomed jacquards fabrics to create a caped gowns & dresses. Also there was a golden color feather long jacket that was painstakingly hand covered each feather with 24K gold leaves then sewn on to the jacket one by one to created this angelic look paired with a puffy embroidered tulle long skirt. There were tears in the eyes of some of the guests as the finale dress walked down the runway. 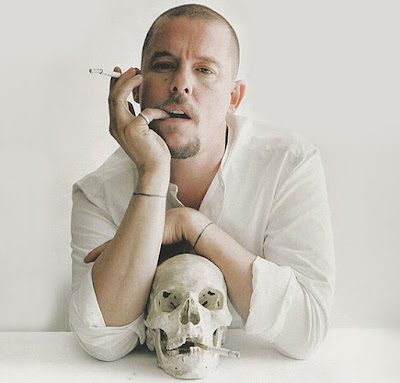 There were some talks about the possible succession designer Gareth Pugh will take over the house of McQueen, but for us, there will only be one Alexander McQueen! Rest in peace Mr. McQueen! 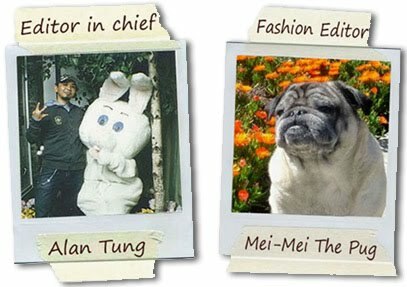 You’ll be missed!